Just copied program 61 of the VOA Radiogram on 5145. The program was transmitted from the Edward R Murrow Transmitting Station down in Greenville, NC. I've seen this place many times and am happy to have copied its transmission now. I'm also lucky that I was watching Twitter just before the program started and was reminded to tune in. Here is the text as I received it. Welcome to program 61 of VOA Radiogram from the Voice of America. same for MFSK32, MFSK64, and MFSK128. symbol rate of the MFSK mode. In MFSK32, this is VOA Radiogram from the Voice of America. If you have not done so, please start your EasyPal software. 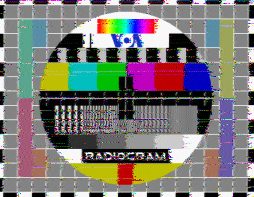 EasyPal digital image mode on VOA Radiogram. resolution. The picture transmission will be just over 7 minutes. high failure rate with EasyPal on shortwave. transmitting station in North Carolina. I'm Kim Elliott. Please join us for the next VOA Radiogram.